Bambusa multiplex Alphonse Karr was named for Jean-Baptiste-Alphonse Karr, a horticulturist from the 19th century. Here in Florida it can grow to 20' tall with 1" diameter culms that are bright yellow with irregular, vertical, narrow, dark green stripes. It prefers some shade in tropical climates, but full sun in colder zones. The shoots are not edible. Maximum culm diameter: 1 1/2"
I've had this one for a few years here in zone 9A central Florida and it's made a nice tight clump of approximately 3 feet in diameter. 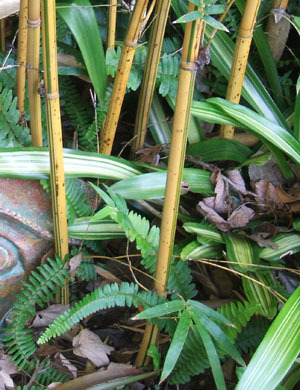 The yellow culms stand out nicely against the other green plants nearby, making this a very desirable bamboo in a small garden.